Create a Python script calculating time differences in the dataset as in attached files. The data shall be imported as ! PyDataset !. entries represent timestamps of product manufacturing. The data is always clustered by columns. The rows are describing product model number serial number and then segmentation of pieces of the product. The final product is labeled with row containing word BASE - it is typically preceded by mostly 3 lines of data, sometimes it may be more lines of data, but typically not more than 6. 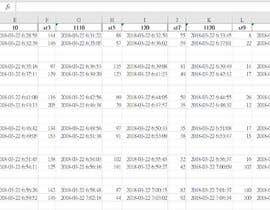 As You look through the excel sheets You will see patterns of data clustering. 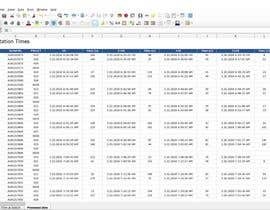 There are 2 spreadsheets attached - one represents basic data and the other has added columns with calculations that I need. 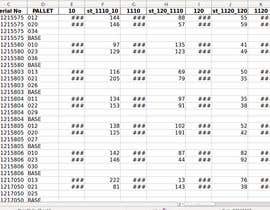 First of all I need this data to be searchable by unique serial No - in excel I added a column with ID number 1 to 70 in this example. the columns highlighted with yellow are the columns that I added - inside of those columns calculations were made - Your script must add those columns and perform those calculations. 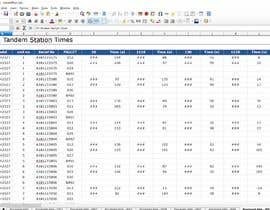 Typically subtractions between time stamps are done inside of the data clusters as You will see in the file. The differences are done between cell on the right minus cell on the left. Sometimes data is corrupted and it results with negative entries - those should be ignored and if subtraction result is negative the cell should be left empty. 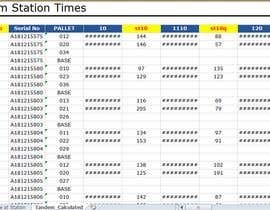 If one of the time stamps in the cell on the right or cell on the left is missing the calculation should be omitted and resulting cell should be left empty. In the end I expect You to write a script that will load data into PyDataset and add necessary columns and perform calculations. Preferably the results should be shown in seconds not hh:mm:ss format - just seconds. The script must handle date changes also doing calculations that for example have time stamps from two adjacent days - over midnight point.